Have you ever tasted authentic Italian Ice? Take a bite and close your eyes and you'd think you were in Little Italy! 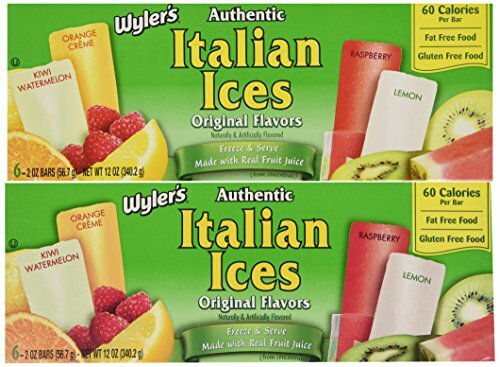 This 4 pack of 6ct per box of freeze and serve Italian Ice bars contains an assortment of kiwi watermelon, raspberry, lemon, and orange creme. Made with real fruit juice, fat free and cholesterol free. You would think these would be in your local grocery store freezer, but chances are they're not, so get a box today and get ready to cool off! At only 50 calories per bar, your whole family can enjoy them! elicious, Refreshing, and easy to make! Just FREEZE & SERVE! If you have any questions about this product by Wyler's, contact us by completing and submitting the form below. If you are looking for a specif part number, please include it with your message.